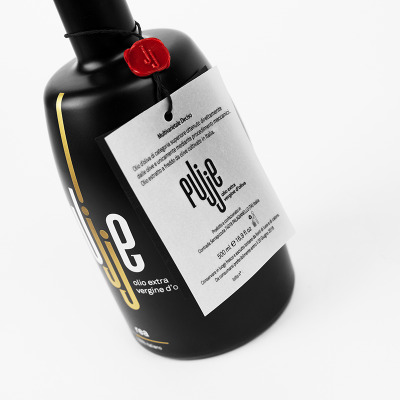 A 'precous' box with two varieties of Pujje extra virgin olive oil that derive from the combination or the exclusive use of the most refined Apulian fruits. Anfitrite is a multicultivar extra virgin olive oil born out from the blend of 4 different types of olive: Cima di Melfi, Pecholine, Nocellara Messinese and Coratina. Slightly golden with marked green shades, providing a complex fragrance thanks to its delicate mix of green olive, vegetables, almond, thistle and tomato leaf. It has a pleasant herbs fragrance. It has a sweet soft-fruit nuance, enriched by bitter tones, reminding of bitter almond and soft spiced pink pepper. Rea is a multicultivar extra virgin olive oil originating from the blend of two types of olive: Coratina and Frantoio. Deep gold enriched with light green nuance. It has a herbaceus as well as a complex and harmonic blend of fresh almond, green tomato, artichoke and unripe fruit. It provides a ﬁrst note of wild ﬂowers followed by an interesting and powerful bitter taste of chicory as well as a spiced ﬂavour of green pepper and ginger with a ﬁnal note of fresh nut. 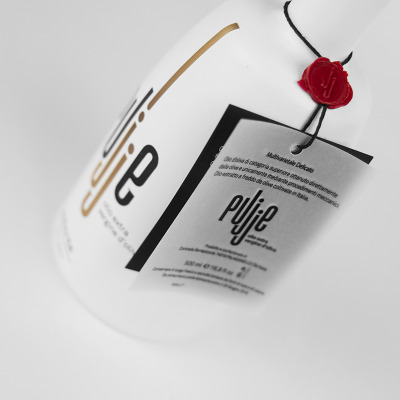 Cold pressed extravirgin olive oil, 100% Italian.